IMPORTANT: Light Cast Media does not control the quality of output or ad placement in Facebook Live or YouTube. Facebook may insert different ads depending on viewers geographic location at different points in your broadcast. Light Cast Media has no control of the content or placement of these advertisements. It is strongly recommended that you DO NOT broadcast your entire worship service to Facebook Live or YouTube. Both systems have music detection systems in place. If potentially copyrighted music or video is detected during your services, both Facebook and YouTube will often stop your broadcast and/or suspend your account. We strongly recommend providing a link to your website as part of your broadcast announcement post so viewers may watch your entire service as intended should your Facebook feed become interrupted by advertisement or content filtering. 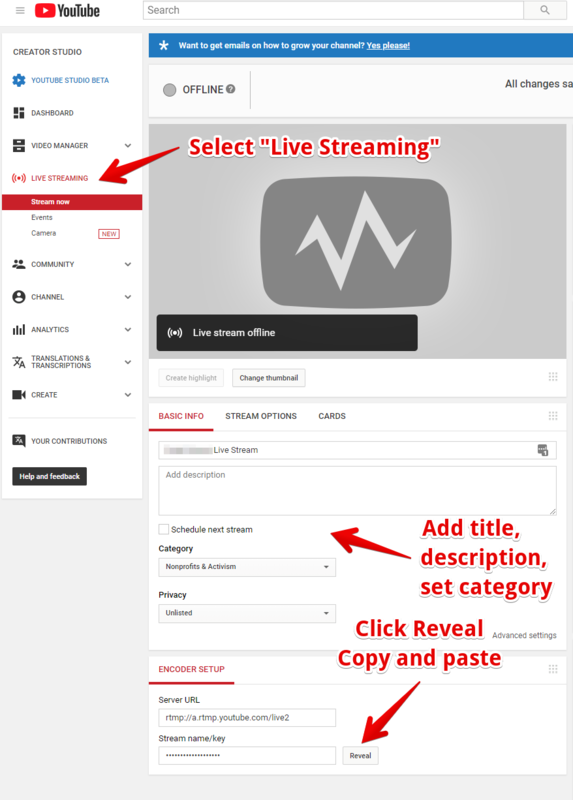 First, you will need to activate live streaming on your YouTube account. 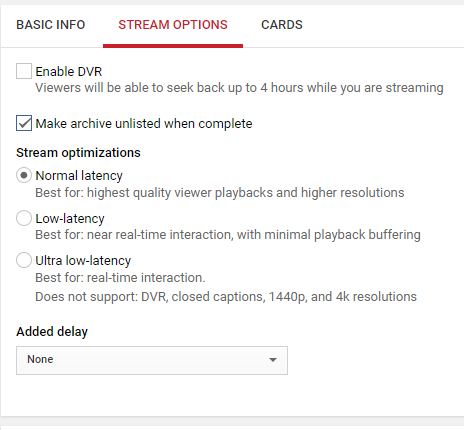 Be aware that YouTube normally takes 24 hours to complete this step. Go to youtube.com. In The top right corner, click the colored circle icon. It normally contains the first letter of your first name. Select “Live Streaming” and “Stream Now” from the menu on the left. This will start the process of creating your channel. After you select create, you should be sent to account verification. Depending on what you chose in the previous step, you will receive either a text message or phone call with a 6-digit verification number. After this, your account will be verified, but you must wait around 24 hours for live streaming to be activated on your account. 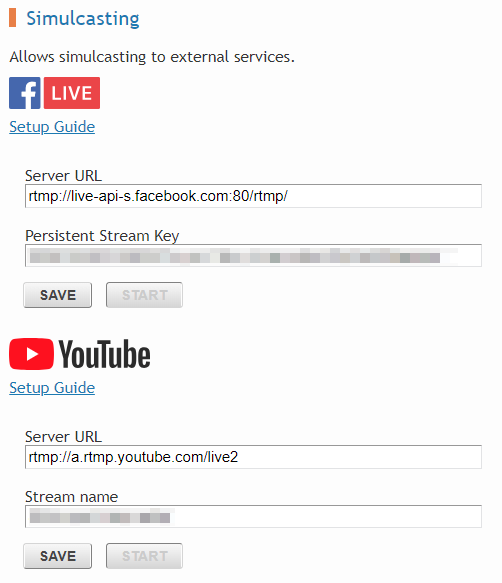 First, set up your stream using our live transcoder. Go to YouTube.com. In The top right corner, click the colored circle icon. It normally has the first letter of your first name in it. Fill in the title, description and category. 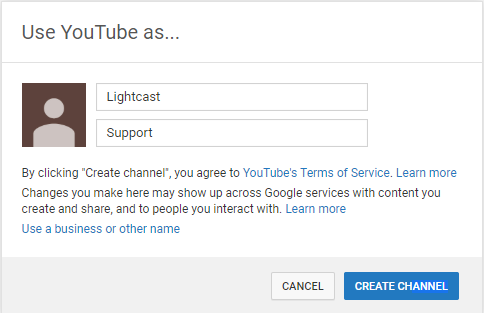 Broadcast your service to the Light Cast Media Cloud Transcoder. As your sermon begins, click “Start” under the YouTube section of Simulcasting.